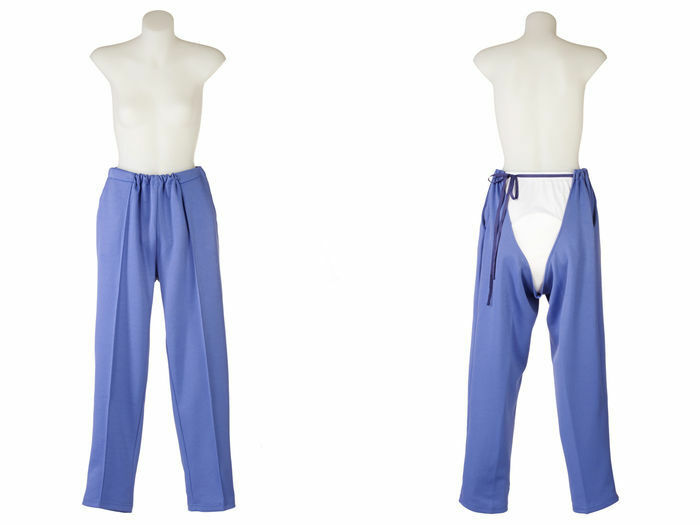 Our Ladies assistive pant is open at the back for easy access to continence aids whilst offering dignity and comfort. The carer stands in front of the wearer who is either in a hoist lifting system, on a bed or in a chair. We recommend for easy dressing – step 1 the pant slides up the legs, step 2 pass the long side tape behind her back, and step 3 gently tie to the short tie on the other side. If you need more information or help with ordering please feel free to phone us on 0402 075 290 we are happy to help! The soft knitted polyester fabric ensures comfort when sitting and no loss of dignity. Unlike alternate styles with Velcro®, zips or studs down the outside/inside legs which can harm fragile skin, such styling is undignified, especially in the slow dressing process. The Petal Back assistive pant complies with “No Lift Policy” and continence management programs. Perfect for wearing while using a wheelchair, princess tub chair or recliner chair. The dressing process is quick and easy saving nursing time and reducing distress to the wearer and the carer. No need to lift or roll will protect the carer from injury too. Fabric Care: Easy care, no ironing required, washes perfectly time after time in aged care & commercial high temperature laundries. Shop with confidence knowing that Petal Back Adaptive Clothing have been supplying quality adaptive clothing to Australian's since 1994. Our products have stood the test of time and are loved by carers, nurses, families and residents of aged care / nursing homes for over 20 years! We are a registered NDIS provider, please contact us for how to purchase our disability clothing on your plan. Aged Care Residents, Seniors, Elderly, Infirm, Nursing home high care residents, hospital stays, nurse care, assisted living, carer aided dressing, Seated Dressing, People with physical disabilities, Special Needs care, Paraplegia, Quadriplegia, Bariatric people. Also may assist in dressing for those with Alzheimer's Disease, Catheter users, Dementia Patients, Palliative Care, Diabetes, MS Multiple Sclerosis, Parkinson's, Shoulder stiffness, Stroke, Polio, Cerebral Palsy, Motor Neurone Disease, Oedema and swelling, Incontinence and reduced bladder control, SPI Spinal Cord Injury, Brain Injury, MD Muscular Dystrophy, Contractures etc.